You can use the Find it! button RefWorks to locate online full text of articles available from the University of Arkansas Libraries. Simply click on the Find it! button on the upper right side of the record in brief or full view. Find it! 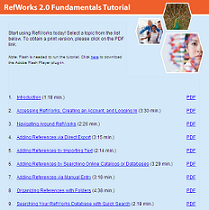 will try to locate a matching resource based on the information in the RefWorks record. Sometimes your RefWorks record may not have all the information necessary to find a match; for instance the ISSN (standard journal number) may be lacking. If Find it! does not locate a matching resource, we recommend that you search the title of the journal in the online catalog. If the Libraries do not own the item in paper or online, you can use the Find it! service to place an Interlibrary Loan (ILLiad) request to borrow the item from another library. Read more about Find it! View the Libraries' short video on the Find it! service.